The Conterra Wing Tanks are designed to help move your gear from an insertion point to the staging area. 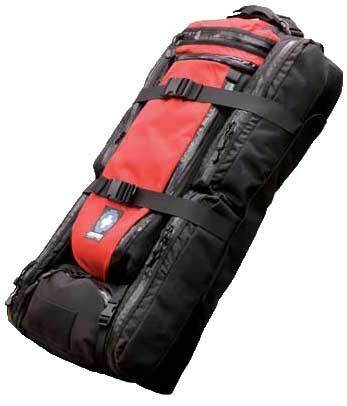 This horseshoe-shaped module incorporates three interconnected pockets that securely attaches around the Strike ERT Pack, adding over 1,500 cubic inches of storage. The Wing Tanks can be easily dropped off at quarters or equipment cache. The side handle of the Srike ERT can still be used with the Wing Tanks. Additionally, the Wing Tanks have an ingenious attachment to the Strike ERT's top handle that greatly adds to its strength. The side pockets are 30" long each, with waterproof / dustproof zippers. The bottom pocket is 6" X 6" X 12" and opens with a #10 waterproof zipper.